How many times have you seen themes claiming to be multi-purpose lately? It seems there is a flood of multi-purpose themes in today’s market. However, I still have a hard time understanding what actually this multi-purpose phrase in theme world means. If it means that the theme can be used for any purpose, then every theme is multi-purpose by default. We at Anariel Design don’t see much weight in the multi-purpose hype other then marketing. So, we continue to develop high quality themes that focus on a certain niche, but do it properly. 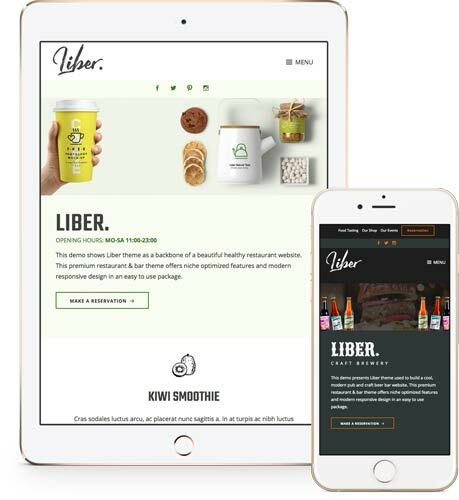 Therefore, today we are proud to announce our brand new premium niche WordPress theme we named Liber. What sets a niche theme apart from the rest is support for the niche specific requirements and applying the best practices for the overall layout that is common in that niche. Liber is built with restaurant, bars and pubs in mind and comes with set of features that a modern restaurant, bar or pub will want to have on their site. as a restaurant owner you might want to give your customers option to book a table online. With Liber this is just a few clicks away. Liber supports the awesome “Restaurant Reservations” plugin by styling it to visually fit perfectly to the rest of the theme. people like reading testimonials and your restaurant might profit by showing potential customers testimonials of your satisfied customers. Liber makes it easy to display testimonials in an elegant way. restaurant/bar opening times is an important information and deserves a prominent placement. Liber enables you to add opening times inside your header. What can be more prominent than that? 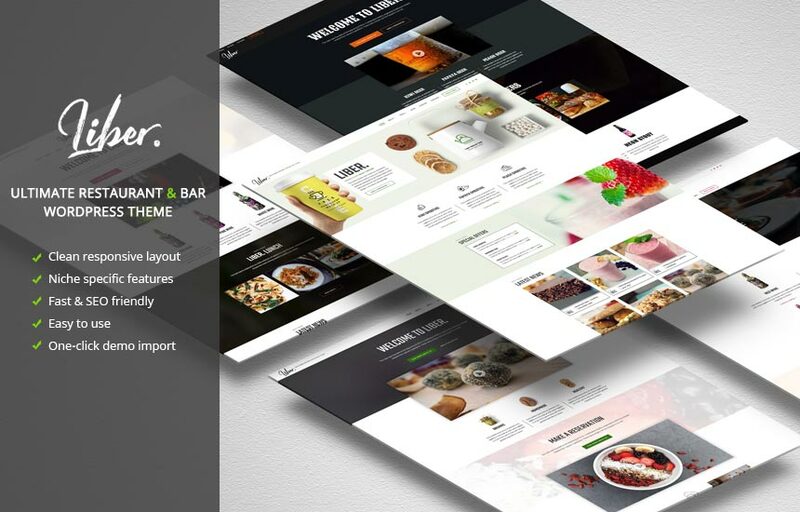 Theme layout as well as color scheme and typography we recommend in Liber demos is chosen after in-depth research of tens of high quality real life restaurant and bar websites. You can of course easily adjust it all to your preferences from the WordPress Customizer. 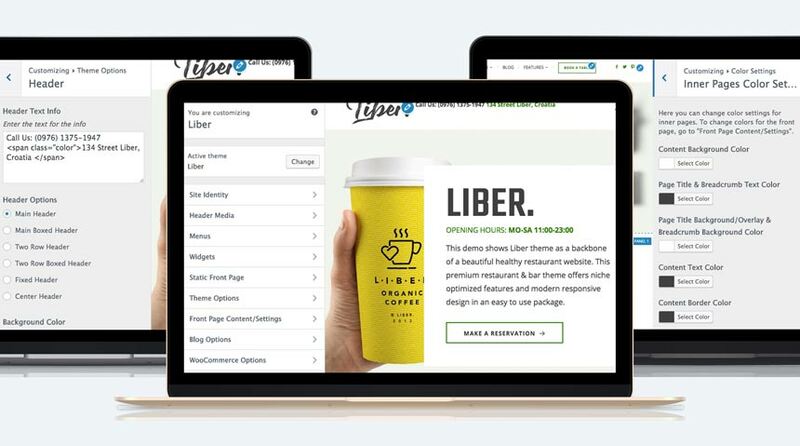 Liber comes with a whole variety of customizing options many of which are available directly from the WordPress Customizer. There are different header layout and color options, header image options, front page layout options, blog layout options, color options and more. Liber comes with a whole variety of customizing options many of which are available directly from the WordPress customizer. It comes with a brand new and versatile approach of creating the front page utilizing user friendly panels and feature pages. Beside the options available in the Customizer there are 8 page templates that you can use to create different layouts for your inner pages. In today’s mobile world all these features would make no sense if they wouldn’t be responsive and translate equally well on different screen sizes. With Liber theme you are on the safe side as it is built following the latest practices in responsive design. Responsive design has one crucial goal and that is to make your content easily readable and accessible across different sized devices. 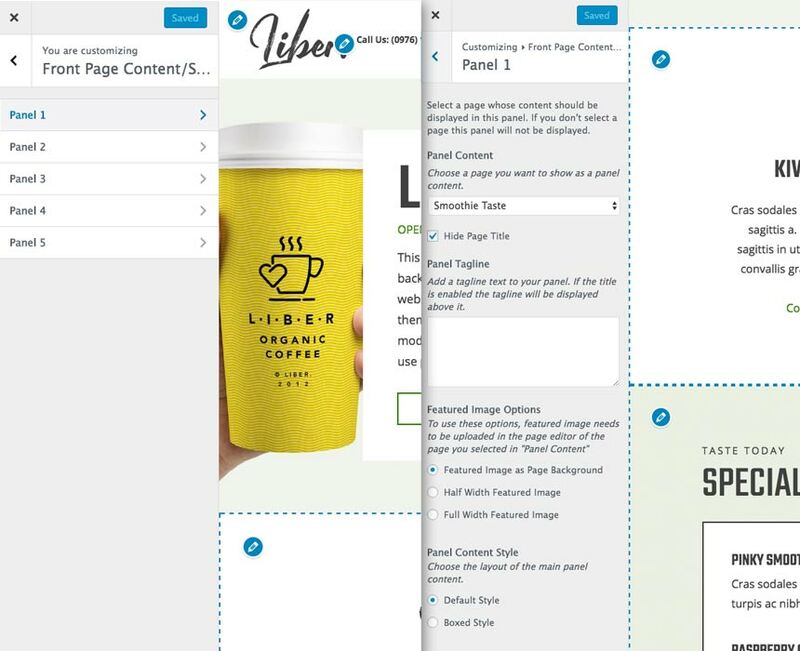 Liber will automatically adjust its layout, font and image sizes to perfectly fit the size of the screen your visitor use to browse your site. 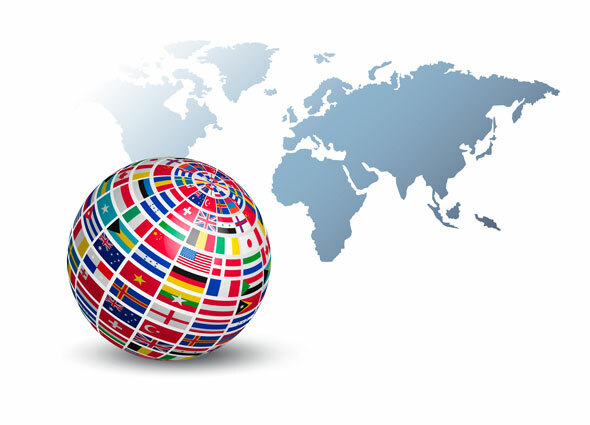 What if your restaurant is in Spain, Italy or Germany and your site needs to be in these languages? No problem, Liber comes with POT file that makes theme related text strings easily translatable by using a POT editor like the Loco Translate plugin. It also support popular multi-lingual plugins Polylang and WPML. Some languages like Hebrew or Arabic use right to left writing and Liber is ready for that also. You can switch the whole layout to support RTL writing with a single click. Beside the niche specific features I mentioned before there are a number of non-specific features that might be equally useful. There is a built in support for the hugely popular WooCommerce plugin. This makes adding a shop page that visually fit the rest of your site a piece of cake task. There is a built in social bar where you can list your favorite social networks in an elegant way to make it easy for your customers to spread the word. Although there is a ton of layout options built into the theme Liber also supports Elementor page builder plugin that enables you to create additional layouts for your pages. There is often a bit of confusion when installing a new theme. Especially for people beginning with WordPress it can come as a shock to realize that when they install the theme it doesn’t look like the demo site. The reason is actually quite simple, the demo site is a full fledged website built using the theme, plugins and a lot of demo content. So to make a site look like the demo it is needed to install plugins, add content and set it up the way it is set up in the demo. Although we do recommend start building a site from scratch with own content following the guides in theme documentation, for many people it can be convenient to start with the full demo install and then start replacing demo content with their own. For that purpose we integrated one click demo install feature. 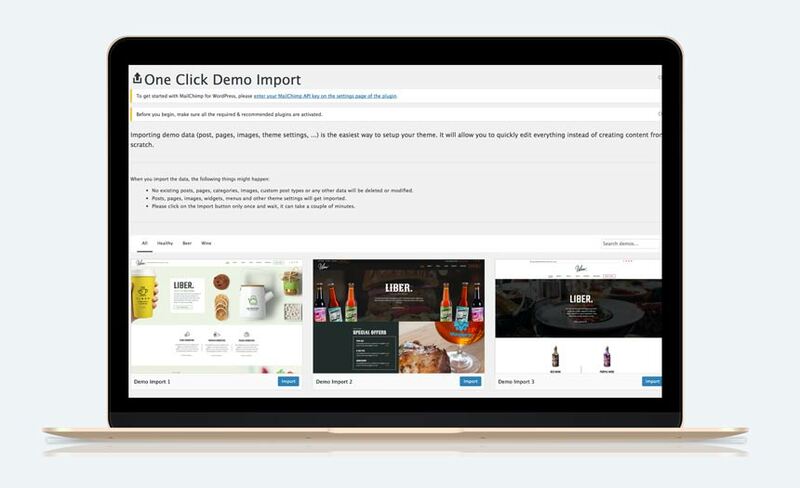 This enables you to easily install plugins used in the demo, import demo content and have your own replica of the theme demo in no time. Liber theme is included in all three of our pricing plans starting at only $59 (excl. VAT). All plans include access to all our themes as well as access to support and updates for a period of time defined in each plan. 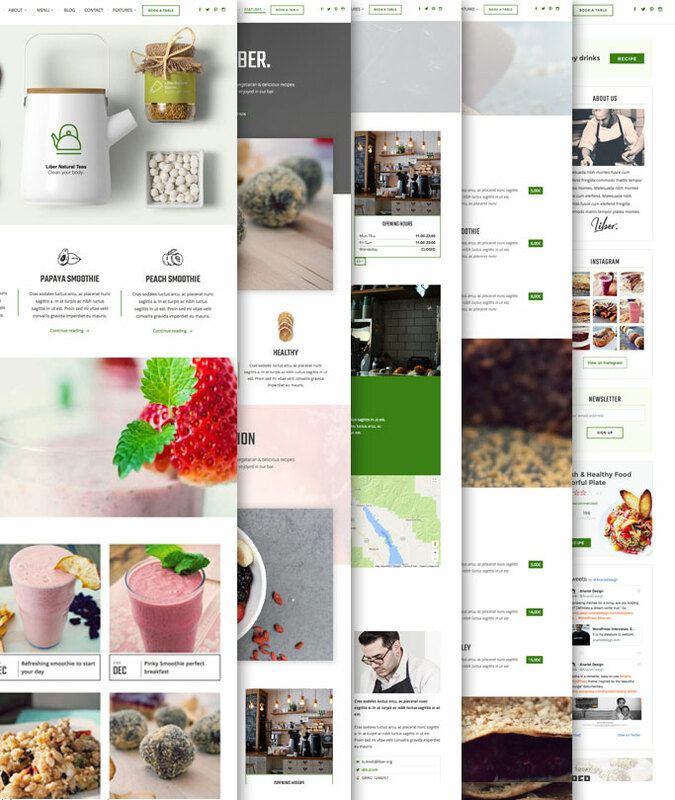 For a hands on experience make sure to check Liber theme demo here.